With all the development occurring in the cultivation and dispensary sales sector of the legal cannabusiness, it can be easy to forget that online marijuana jobs are experiencing some of the most growth. Nowhere is this more evident than with marijuana web designer jobs. As greater numbers of internet startups become established and more cannabusinesses seek to expand their company profile, web designers will be in heavy demand. 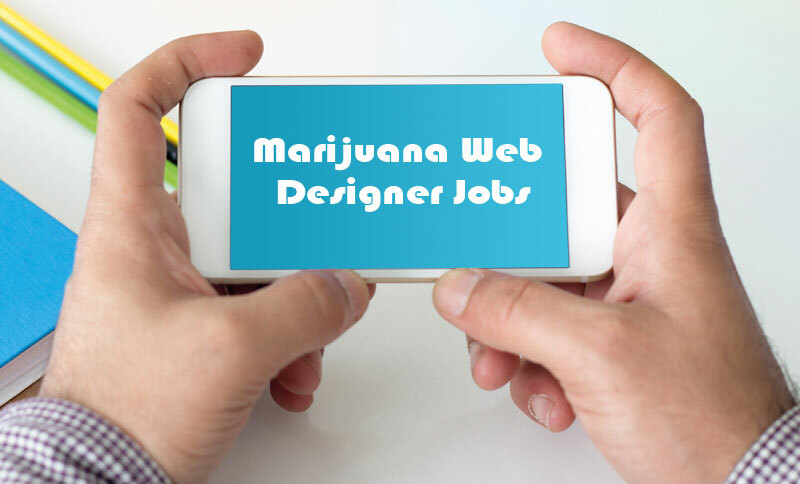 Regardless of what sector of the industry is in question, marijuana web designer jobs are needed to bolster a strong brand presence. As the legal industry continues to expand and competition between companies surges, cannabusinesses around the country are upping the ante of their online potential. Online marijuana jobs are going to be the future for many who are and will be breaking into this exciting industry as it continues to gain forward momentum. Cannabis dispensaries are proliferating in greater numbers in some of America’s pivotal tourist cities. Especially on the west coast and Colorado, cities like Portland, Oregon and Denver, Colorado have dozens, if not hundreds of legal pot shops competing for the adoration of the medical and recreational cannabis community. Most dispensaries recognize the necessity of having a website to establish their brand; while some business owners opt for cheaper methods of website design with DIY platforms, others enlist web designers to give their shop a distinct, polished aesthetic. As websites like Leafly begin to dominate as an advertising forum, freelance designers and niche marijuana web designer jobs for individual businesses are replaced with one diverse platform. In the arena of online development, marijuana web designer jobs and marijuana web developer jobs are part and parcel with creating a formidable web business. Web designers work with programmers to streamline and manicure the website into something more than just code. It seems that everywhere you look, there’s a new cannabis themed dating or social media app cropping up to capitalize on the growing niche of cannabis users who are active online. The cannabis and web industries have successfully boosted each other’s success, experiencing growth together. In the years to come, marijuana web designer jobs for startups will likely boom in size. With a great amount of flower being produced by grow operations, cultivation operations contract marijuana web designer jobs to step above the competition with crop. Recently, cannabis concentrates and edibles have surged in popularity, resulting in an excess of flower. While many consumers still prefer traditional smoking methods, the diversity of options for customers adds pressure to legal grow operations. Web designers can help to elevate grow operations out of obscurity. Concentrate and edibles processing companies make partnerships with cannabis dispensaries to sell their products. It is important they have a confident website to entice dispensary owners into choosing their merchandise. Concentrates are made by extracting essential compounds, such as THC and CBD from the flowers, leaves and stems of cannabis plants. The process is carried out by cannabis extraction technicians using industrial solvents including butane and CO2. The end result is an amber to black colored substance that varies from oil to glass-like shatter in texture. Edibles are cannabis infused treats that will either get you really baked in the case of THC products, or will help soothe you in CBD form. This process is done by taking decarboxylated cannabis concentrates and mixing them into food products that can be purchased in stores. Marijuana sales rep jobs are often responsible for establishing accounts with dispensaries on behalf of a processing company and it’s important that the brand presence is strong. Salaries for marijuana web designers jobs are inconsistent and depend on the type of employment; with that said, workers in this field carry the potential to make impressive salaries in the high five to six figures. The average salary clocks in around $47,500. Web designers perform many different tasks that encompass a wide variety of individual assignments. Some web designers choose to become more involved in the programming process, while others use as little code as possible. Website designers are responsible for compiling content into difficult sections in the navigation of a website; they control the layout and positioning of images and text on a page. Web designers must be simultaneously creative and organized. An artistic eye is integral, but so is efficiency. Additionally, web designers have to keep in mind the elements of online marketing, such as Search Engine Optimization, SEO. Most marijuana web designer jobs call for workers to have experience in both coding and graphic design. Interested candidates should consider learning programs like CSS and HTML, as well as design programs, such as Photoshop, Illustrator and InDesign. The education requirements for marijuana web designer jobs vary depending on the business. While some employers may desire applicants to have college degrees, others recognize that certification programs can offer a quality education for some careers. Having a college degree will only help you however, so feel free to highlight any experience that makes your application more credible. While over half the American states have legalized cannabis either medically or recreationally, the western half of the country dominates when it comes to cannabis culture and marijuana web designer jobs therein. The City of Roses is known for its fashionably “weird” culture, but did you know it also has one of the most progressive weed cultures as well? In addition to passing recreational legalization in Oregon, the city also has the cheapest legal weed in the whole country! This is why Portland is one of America’s top cannabis cities. Denver is a popular tourist destination for many reasons – one of them just happens to be weed! Denver became the first city to pass into law social cannabis smoking in businesses. Under ordinance 300, patrons of coffee shops, record stores, art galleries and other establishments can vape inside and smoke underside. Seattle is one of the central hubs for technology startups, as well as the host to the legendary Seattle Hempfest. As one of the first states to allow for adult use of cannabis, Washington’s biggest city is one of the most progressive in the country. If there is a trend toward the future of marijuana web designer jobs, it’s looking like a positive one as more states pass legislation legalizing cannabis medically and/or recreationally. Although there are more platforms appearing on the web that allow businesses to design their own websites, web designers come in handy when looking to optimize the potential of one’s brand. Web designers are skilled in organizing your business into a range of web content.